The residents of Acme Acres sat on the steps of Acme Looniversity singing the blues. They've been carrying on this way ever since that menace to merriment, Montana Max, kidnapped Babs Bunny. What they wouldn't do to hear just one of her knock-knock jokes again. You see, it all started during the Animation Festival at Acme Loo. The festival has always been a grand celebration in Acme Acres, highlighted by the acreenings of student films. Every year Montana Max tries to bribe the judges to vote for his film befcause he is accustomed to having his way. He's a rich dude with an attitude. Monty has always been jealous of Buster Bonny and it only made matters worse when Buster won "Best Student Film". That's when mean-hearted Monty reached maximum boil. He was going to get even if it was the last thing he did. While Babs was on her way to Buster's house to congratulate him on his win, Monty and his thugs lured her away to his mansion with the promise of making her a star. To parade his prize catch, Monty brought a TV station and broadcast a live "na-na-you-can't-catch-me" speech for all of the stunned citizens of Acme Acres to see. Well Buster was one bummed out bunny. He was even about ready to give up jumping. But here comes his pals Plucky Duck, Dizzy Devil and Furrball to pledge their help in rescuing everyone's favorite female bunny. With a little help from you, Buster and his buddies can now set out on their adventure- packed mission to the outer fringes of Acme Acres to rescue Babs. Can they possible survive the slew of snares that Monty had laid out for them? You better get jumping or it'll be "curtains" for our playful pals! --From the NES Tiny Toon Adventures instruction manual. 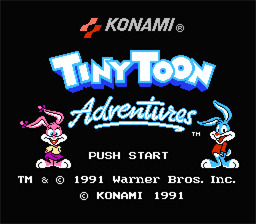 Play Tiny Toon Adventures Now!